Erik Howard was an unheralded nose tackle for the Giants 3-4 defense that plugged up the middle rushing lanes. He demonstrated the versatility, speed, motor, and size to actually play all three down linemen positions. A second round pick of the Giants in 1986, Erik split time backing up Jim Burt, winning the Super Bowl after his rookie season. He started his first full season in 1989, recording 5.5 sacks, 1 FF, and a career high 69 tackles. Howard earned his only Pro Bowl nod for his 1990 efforts, with 3 sacks and 67 tackles. He’d win his second Super Bowl title following the season against the Buffalo Bills. 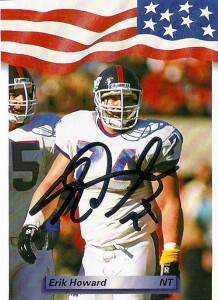 Erik played with the Giants through the 1994 season, when he had a career high 6.5 sacks playing defensive tackle. 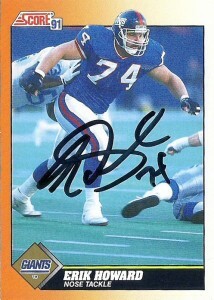 He left via free agency in 1995 for the Jets and retired there following the 1996 season.